Chapters 40-55 of the book that we know as Isaiah probably address a time late in the Babylonian exile, when the prophet proclaims that God wants the people to return to Jerusalem. Keep in mind, though, that it has been years since the beginning of the exile. Most of the older generation, those who remember the way it was before, are gone. The next generation had created a new life here. They were settled, comfortable, and many had established themselves and even grown their wealth. And now they’re being asked to return to a city that is in complete desolation. There is nothing there. There was really nothing to which they could return. This passage is known as the third of the Servant Songs, declaring what the task of the servant should be. The servant speaks straight after God has made the claims that he has the power to deliver Israel from their unfaithfulness. In contradiction to the unfaithful and unhearing Israel, the servant declares that he is obedient and listens to the Lord. The servant is totally confident that God is with him despite all those who have been actively opposed to his ministry and the consequent adversity. This supreme confidence in the presence of God allows the servant to face any future adversity. The call of the servant is to make sense of what happened so that the people will again hear and return to faithfulness. There is a lot here about both teaching and hearing. They go together. The prophet or servant has been faithful in teaching what has been transmitted to him and that teaching will sustain the weary. In spite of the fact that many insist that this is a precursor passage to the Christ event, we have no clear answers about the identity of the servant in Isaiah 40-55 and can only wonder if his message was so unpopular that he suffered because of it. Certainly other prophets, such as Jeremiah, suffered. His suffering and response is depicted in a different way – Jeremiah gets angry with God and wants his adversaries punished. Many Biblical scholars claim that the servant is the embodiment of Israel herself, both the land and the people; in other words, the servant is indicative of any servant of God (including, then, us). I like that characterization. It compels us to enter the story. But, in entering it, the servant, the people, in fact, WE, are called to confront the evil and suffering of the world rather than dismiss it as not “of God”. It is to these parts of Creation that we are called to help bring redemption and new life. We are not promised that it will be easy, but YHWH stands with us. As we are celebrating this Palm / Passion Sunday, there is no doubt that we can identify Jesus with the words of the Isaiah 50:4-9 in which Jesus has had to face and will face his tormentors. He sets his face towards Jerusalem, riding in with the knowledge that the crowds could easily be fickle. Jesus has relied on God to sustain him and he continues to rely on the help of God. But even in the face of adversaries, God sustains him. It is not that God “fixes” it, but rather walks with us through it. 2) What vision of the future does that give for your own life? 3) How often do we really believe this or do we assume that God will “fix” it? What is the difference for our faith? 4) If you interpret the servant as the embodiment of all servants of God, what does that mean for you? On the surface, being of the “same mind” as Jesus would mean to be like Jesus, or to think like Jesus. But it means more than that. It is a call, rather, to enter the very essence that is Jesus. It is a call to pattern our lives after Christ. It appears here that “being in the form of God” may be opposite from “being in the form of a slave”. Essentially, Jesus emptied himself and became dependent upon God, fully surrendered, a servant of God. He became fully human. He surrendered self-advancement and instead became fully human, fully made in God’s image. 2) What, for you, does it mean to assume the mind of Jesus? 3) What does it mean to surrender to God? Why is that so difficult for us? 4) What does this passage say to you about humility? 5) What does this passage say to you about power? It is interesting that over half of this story is about getting the mode of transportation—where to go to find the animal, what to do, what to say. You can imagine what the disciples were thinking. For this we left our fishing nets? Surely they imagined a grander assignment. But this seems to be an important thing in every account of this story. Perhaps it is a reminder that sometimes following Jesus means doing mundane tasks that, alone, do not seem important, but in the grand scheme of things, are paramount to the story. There is some significance, though, to the idea of him riding a colt that has never been ridden. (Similar to coming into the world through a virgin womb.) Jesus is different. It has never been done this way before. Here, though, Jesus is in the bustling capital city. He is no longer in the villages and open country of his home. The celebratory parade is also a protest march. The disciples should have known what was happening. Jesus had already laid it out for them. But they still did not comprehend what he had said. At this moment Jesus begins the sharp descent down the Mt. of Olives, winding his way toward Jerusalem. The road is a steep decline into the Garden of Gethsemane and then begins to ascend toward Mt. Moriah and the place of the temple. At this moment, the crowd sees him as a king, as one who will get them out of where they are. So this is a parade that befits a king. 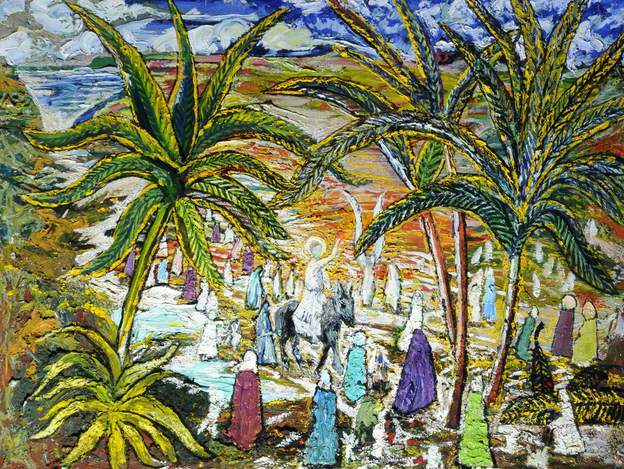 “Hosanna”, “the Coming One”, the one who restores Jerusalem. He enters. This is the moment. This is it. What they didn’t recognize is that Jesus brought them something that they had never had before—peace, truth, justice, and love. What they didn’t recognize is that Jesus had indeed come to restore them not to what was but to what should’ve been all along. This part of the story is not JUST a celebration, though. Although Jesus’ entry into Jerusalem on the first Palm Sunday was victorious, it had overtones which pointed to the suffering to come. If he entered through the East gate, which is the presumption, that is the gate through which it was prophesied that the Messiah would enter, and so laid himself open to charges of blasphemy. The rumblings of what would come next were all around them. That is why in our modern-day liturgy, this day has evolved into “Palm/Passion Sunday”. It is not a mere celebration; it is the beginning of what is to come. That is a true and faithful readings of the Gospel texts. The writers knew that these “Hosanna’s” would quickly turn to accusations, a trial, and crucifixion. Marcus Borg and Dominic Crossan suggest there was not only a procession from the Mount of Olives on the east that day, but also a Roman procession entering from the west, which would have had as a focal point the Roman governor named Pontius Pilate. The juxtaposition of these two processions would have set up quite a contrast. One came as an expression of empire and military occupation whose goal was to make sure oppressed people did not find deliverance. It approached the city using horses, brandishing weapons, proclaiming the power of empire. The other procession was quite a contrast, using a donkey and laying down cloaks and branches along the road. The one who was coming in the name of the Lord quietly, but profoundly, proclaimed the peaceful reign of God. Their contention is that our whole Palm Sunday “celebration”, as we call it, was a parody of the world we know, a satirical reminder that we are different. The miracle of the Red Sea,” the rabbis taught, “is not the parting of the waters. The miracle of the Red Sea is that with a wall of water on each side of him, the first Jew walked through.” The implications are clear: God is not in this alone. Yes, God may be all-powerful and eternally unfailing, but that’s not the point. The real key to the coming of the reign of God on earth, the rabbis imply, is not God’s fidelity. The real determinant between what ought to be and what will be in this world is the mettle of our own unflagging faith that the God who leads us to a point of holy wakefulness stays with us through it to the end. The key to what happens on earth does not lie in God’s will. All God can do is part the waters. It lies in the courage we bring to the parting of them. It lies in deciding whether or not we will walk through the parting waters of our own lives today. Just as surely as there was need for courage at the Red Sea, just as surely as there was need for courage on Jesus’ last trip to Jerusalem, there is need for it here and now, as well. The Waters part all around us, too, now. The road to Jerusalem is clear. We are surrounded by situations that have solutions without solvers with the political will to resolve them: The old cannot afford their prescriptions. The young have no food. The middle-aged work two jobs and slip silently into poverty whatever their efforts. The globe turns warmer and more vulnerable by the day. Species disappear. The unborn are unwanted. The born are uncared for. Racism, sexism and homophobia destroy families and poison relationships. The mighty buy more guns. The powerful pay fewer taxes. The national infrastructure slips into disrepair. Fundamentalist groups and governments everywhere seek to suppress opposition, to deny questions, to resist change, to block development. We are all on the road to Jerusalem again; some of us dedicated to restoring a long lost past; others committed to creating a better future. The honest answer, the smart answer, is “Not me.” And many people say it. They walk away and abandon the church to its incestuous self where only those remain who profit from the structures or who dabble in the structures for whatever social or personal placebo it might afford. They leave the political system and ignore the elections. They flee the tough conversations in the family and the office in the name of “nice.” They say they have “no time for politics” and “no interest in the church.” They drop out on the way to Jerusalem. But there are those others who keep on shouting, who keep on telling the story even to those with no ears to hear. Over and over again they cry out. But is it worth it? And does it work? Did the disciples on the road to Jerusalem make any difference at all? Well, look at it this way: It got our attention, didn’t it? 1) What meaning does this hold for you? 2) Where would you have been in the parade? 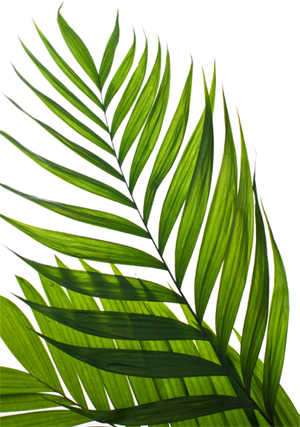 3) What does Palm Sunday mean for you? We’re good at planning! Give us a task force and a project and we’re off and running! No trouble at all! Going to the village and finding the colt, even negotiating with the owners is right down our alley. And how we love a parade! In a frenzy of celebration we gladly focus on Jesus and generously throw our coats and palms in his path. And we can shout praise loudly enough to make the Pharisees complain. It’s all so good! Just a reminder that I’m posting a reflection daily during the Season of Lent on http://dancingtogod.com/. Some of the reflections are related to the Lectionary passages for the week.